When you are living in survival mode, your finances are literally day-to-day. Each check is carefully planned out and you may be worrying about how you are going to cover each of your bills during the month. It can be exhausting because when you are not working to make more money you are worried about how to make your money stretch or last. Here are seven steps you can take to get out of survival mode and turn your financial picture around. You will likely need to address all seven to see a difference in your finances. Generally, when you are in survival mode, you have one of two big issues. Either you do not make enough money and you have an income crisis or you have a spending problem. You may have a little of both. The easiest way to figure out your issue is to write down your set monthly expenses and compare it to your monthly income. If your set expenses (including groceries but not entertainment costs and other luxuries) are more than your income, you have an income issue. If you on paper, you can easily cover these costs, then you have a spending issue. If you have an income issue, you will need to set up a budget that covers just the bare necessities. You will need to cut out all of the extra spending so that you can begin to put money aside or just cover the basics. This will not be enough to change your situation, but it is the first step. If you have spending issues, then your budget is the biggest step in changing your situation. You need to limit and prioritize your spending. This means setting a certain amount you can spend in specific categories each month. The next step you need to take to improve your financial situation is to increase your income. You can look for both short and long-term solutions. A good short-term solution would be a second job. A long-term solution may mean a new job or switching careers so that you can earn more money. It is important to look for a job that will pay you enough so that you can make ends meet with just the one job. When you do that, you will be able to really thrive financially. This may mean going back to school and getting a degree or more certifications to increase your earning power. If you are in survival mode, you need to find ways to significantly reduce the amount you are spending on different categories. Instead of just focusing on cutting your luxuries or other items, you need to look at ways you can reduce your biggest expenses. This means looking at things like your house payment or rent. If you are house poor, you may need to sell your home or look at finding a roommate to help reduce your housing costs. If you are renting, roommates are an option, but moving to a more affordable apartment may make things easier. Similarly, take a look at your car payment. If it is high for your income, you need to find a way to reduce it. You may need to sell your expensive car and look for an older reliable car so that you can reduce these expenses. When you are working multiple jobs and scrambling to make ends meet, you may not feel like you have time to cook. Eating at home is usually at least double what you would spend if you cooked at home. Although it does take time and planning, cooking at home can help you save money. If you can move away from convenience foods and cook from scratch, you can save even more in the story. For example, if you regularly get a value menu at a fast food place, you are likely paying around $7.00 to $8.00. If you buy a frozen dinner at a grocery store, the cost is going to be about half of that. If you make sandwiches at home, you can bring the cost even lower with just a little bit more effort. Try packing your lunch to work and see how much you can save. You may already be living at the bare minimum with no money spent on entertainment costs or any extras. However, if you can find additional ways to save money, you will be able to turn your situation around more quickly. You may choose to stop unnecessary spending or to look for ways to save even more. If you carpool to work, you can cut back on your transportation costs. Try shopping at a different grocery store or thrift stores to save money. Your emergency fund is one of the best things you can have to stop living from crisis to crisis. It makes it easier to stick to your budget because you know you have something to fall back on if the car suddenly breaks down. When you are not worried about the next financial crisis, it is easier to focus on your job and finding ways to earn more money. Start putting aside money each month to build an emergency fund of at least $1,000 and up to one month’s expenses until you are out of debt. Most people in survival mode have at least a little bit of debt hanging around. 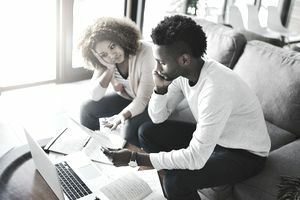 It may be that you have used the credit cards to get you through a tough month or out of a jam, but you cannot seem to pay them off each month, and the balances are creeping up. Look at how much your debt is taking out of your budget. It may be that you would have enough to live on if you did not have debt payments. Set up a debt payment plan and work on getting out of debt so you can begin to build wealth and handle your finances properly.